← Are There Tags Still Hanging On Your Gift? Who is this saint that we celebrate on February 14 with hearts and chocolate and candlelit dinners and greeting cards galore? Some scholarly individuals say that he was a priest executed on February 14 because he would not deny his faith in Christ. Others say that Valentine was a romantic Christian during Emperor Claudius II reign. When the emperor outlawed all marriages and engagements, Valentine secretly performed the nuptial ceremonies. For this reason he was beheaded on February 14. And still others claim that Valentine was killed because he helped Christians escape from prison. There is a legend that the reason we give Valentine cards is because the daughter of Valentine’s jailer fell in love with the saint during his confinement. Valentine wrote a letter to his love and signed it…yes, you can see it coming….”From Your Valentine”. My ethnic heritage claims Saint Valentine as the patron saint of beekeepers. He was a honey of a guy. Sweet. All of the conjecture is fuel for skeptics who admonish us with words written and spoken concerning how silly it is to celebrate a day based on an uncertain personhood. Crusaders appear to free us from the manipulation of the greeting card industry. Alternative news sources remind us that the chocolate manufacturers secretly teemed up with the floral associations and the restaurant associations to take advantage of our romantic gullibility. I have hearts glued to the mirrors in the house. And heart paper plates in the pantry. The bathroom is decorated with red and silver heart garland. Red clothing accessories are being scouted out to serve as a backdrop for the beautiful heart necklace I have already purchased. And my family looks forward to me serving red heart shaped pancakes every Valentine’s Day while I sing them crazy love songs. Because no matter how the details all fall out, I think it is an amazing thing that we celebrate this man Valentine, who ever he was, with L.O.V.E. And that thought, that one man could inspire a holiday based on L.O.V.E., makes me wonder. If there was a holiday just for me…a Christina Day…how would the world decide what theme they should celebrate it with? I wonder. With concern. This entry was posted in Valentines Day and tagged Amore, Christianity, holidays, love, Saint Valentine, St. Valentine, Valentine, Valentine cards, Valentines Day. Bookmark the permalink. What has love got to do with anything? St. Nicholas was a real saint too! Agape love is a lot different from eros love. It is self sacrificing. Flowers, cards, and candy are nice, but I’m doing the laundry for my valentine – so she does not have to. Then taking her out for dinner! Greater love has no man than this, that he would lay down his life for his friends. Thank you for the great reminder that agape love is God’s love…and God’s love is a sacrificial love. And sometimes laying down your life looks like picking up the dirty laundry. May your Valentine’s Day be blessed. 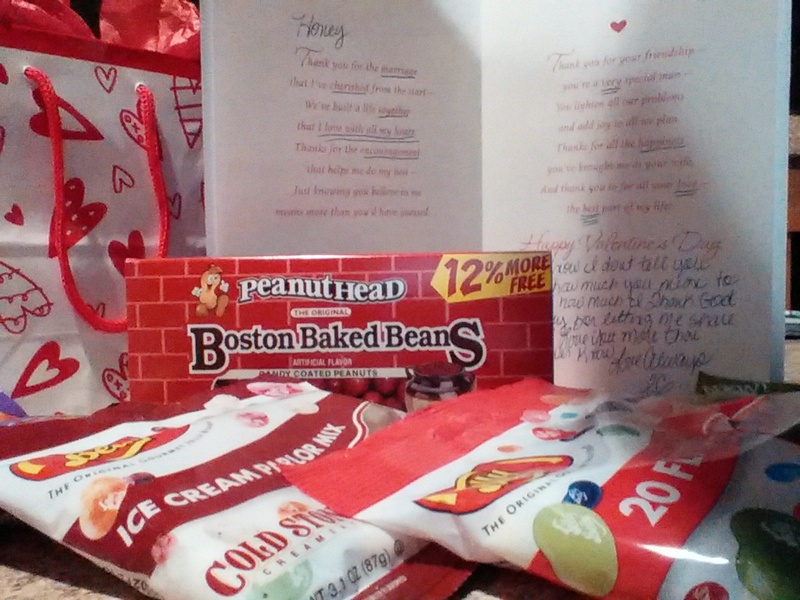 “Heart and chocolates and cards galore,” not forsaking the jelly beans and BBB’s! Although my Honey travels, she never forgets those! Woo Hoo! Books. I think MT Day would be celebrated with required reading!!! Happy We Love Because He First Love Us Day to you also. Thank you for your constant encouragement…that is better than chocolate! !